CALL US NOW IF YOU ARE HAVING ISSUES WITH YOUR FRIGIDAIRE® REFRIGERATOR! We are open 24/7. There are a number of reasons a Frigidaire® refrigerator might break. The compressor may stop working, the motor can get something caught in it, the door can stop sealing properly or the thermostat can malfunction. Fortunately, each of these problems can be fixed relatively easily if you recognize the signs and call someone right away. 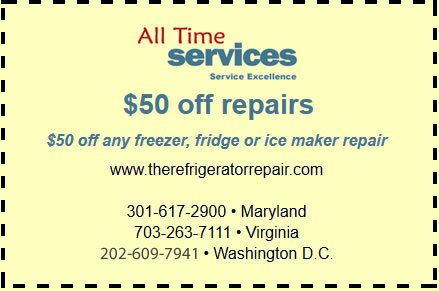 For quick Frigidaire® refrigerator repair services in Maryland, Virginia and the greater Washington D.C. area, call All Time Services at the first sign of trouble. Our technicians are trained to work on all models of Frigidaire refrigerators so you can be sure we’ll have your fridge back up and running properly before you know it. No matter how nice a model your Frigidaire® refrigerator is, there are likely to be problems with it eventually. As all appliances age, the risk of breakdowns increases. This is especially true for refrigerators because they’re used every hour of every day for years, nonstop. However, it’s what actions you take when problems do occur that will determine whether you continue using your Frigidaire or are forced to buy a new one far sooner than you should have to. Above all else, call a professional at even a hint of a problem with your fridge. These are all potentially big problems that need to be dealt with right away. Moreover, you shouldn’t attempt to fix them by yourself. Many refrigerator owners attempt to make repairs and rather than solve the problem, they create new ones, especially if the original issue is related to core components like the compressor or evaporator coil. The best course of action to take if you’re having problems with your Frigidaire refrigerator is to make a quick call All Time Services. 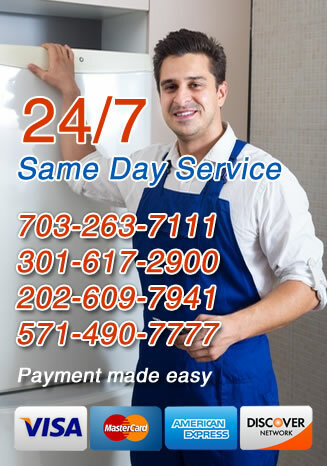 We have been repairing fridges for homeowners in Arlington, Virginia, Gaithersburg, Maryland and the surrounding areas for years. We understand Frigidaire refrigerators and how to get them working again. Whether you have a puddle of water under your compressor or are worried about the excess ice in your freezer compartment, call us today to schedule a visit with one of our experienced technicians.